Singapura cat is the smallest cat breed. Their name comes from the traditional Malay name for Singapore. These cats are also sometimes called Drain Cats or Kucintas. The breed was originally thought to have come directly from Singapore, but there has been some controversy around this fact. The original story is that Tommy and Hal Meadow, who established the breed in the United States, had found the three kittens in Singapore and then later brought the kittens home with them in 1975. Some feel that the cats actually started life in the United States, then went to Singapore, only to return to the United States later with the Meadows. Since the breed was established though, many people have traveled to Singapore and found similar looking cats. One such cat, in fact, was found in 1981 at the Singapore Society for the Prevention of Cruelty to Animals. The Singapura was accepted for registration by the Cat Fanciers Association (CFA) in 1982, despite its controversial history, and granted championship status in 1988. The Singapura is officially recognized in only one color and type, the sepia agouti. This name means each individual hair has two shades. Ivory is the color at the base of Singapura hair and the hair color goes toward dark brown at the tip. The only real variation within the breed comes from a recessive gene that has been traced back to one of the original three cats. This recessive gene causes solid colored kitten in some cases. Many breeders have begun testing for this gene in order to prevent the solid colored kittens and to remove this trait from the gene pool. 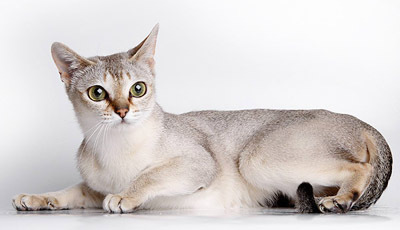 The Singapura is a stocky breed of cat that is small in size. A fully grown female Singapura weighs 5 to 6 pounds (2-2,5 kg), while the male is a little larger at 6 to 8 pounds (2,5-3,5 kg). These cats don’t reach their full size until 15 to 24 months of age, causing some veterinarians who are not familiar with the breed to become concerned about the cats growth. 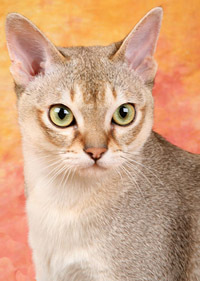 Singapura have large, dominate ears that are slightly pointed and give them an alert expression. Their eyes are almond shaped and come in colors ranging from a pale green color to hazel or gold and copper. Their eyes are also offset by dark mascara like markings. A traditional tabby M appears on the forehead of Singapura. Their coat, in looks, is described as being similar to that of a cougar. There are bars on the inside of the front legs of the Singapura and on the knees of the back legs. These bars underscore the delicate coloring of the cats. Singapura coats are very short and fine. The legs of the Singapura end in small, delicate feet. The tail is slender and slightly shorter than the length of their body and it has a blunt tip. The Singapura is described as active, curious and playful, all attributes that are thought to make them good family pets. These cats are intelligent and have very interactive personalities. Singapura will seek out the attention of their families. The Singapura also have a very curious nature which leads them to perch on high places, in order to fully take in their surroundings. Singapura have a soft, gentle voice and they tend to get along with other cats in a family. Singapura cats don’t need a lot of specialized health care, but they do have one major health problem due to their limited gene pool. This problem is uterine inertia. Uterine inertia is an inability to expel the fetus during birth due to weak muscles. This condition was passed down from one of the original three cats and has not yet been removed from the breeding stock. This disorder means that some of the cats will need to have their kittens delivered by Caesarean Section. There are no other major health concerns, though some breeders are concerned regarding the narrow gene pool the breed comes from and are looking at ways to expand this to fortify the breed without losing the desired characteristics.